For a warm salad, have the greens prepped and ready to dress when the hot chicken comes out of the oven. Using two kinds of paprika makes the dressing a little smoky and a little sweet. Preheat oven to 425°. In a large bowl, rub chicken with 2 tbsp. oil; 1/2 tsp. each smoked paprika, regular paprika, and salt; and the garlic. Lay chicken on a rimmed baking sheet and roast until cooked through, about 20 minutes. Meanwhile, in a small bowl, whisk together vinegar and 4 tbsp. oil, 1/4 tsp. each smoked paprika and regular paprika, and 1/2 tsp. salt. 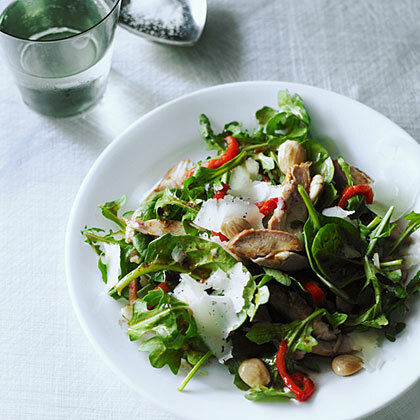 Combine arugula, spinach, peppers, and almonds in a large bowl, tossing gently to mix. Thinly slice hot chicken, add to salad, and toss with half the dressing. Divide salad among plates and scatter with cheese. Serve with remaining dressing on the side.